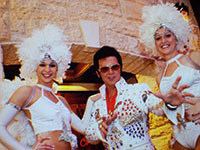 Spice up your casino night with the addition of our beautiful showgirl greeters and an authentic Elvis impersonator. Our greeters will welcome your guests to this exciting fun-filled casino night, then, with his exciting 45-minute performance, Elvis will take your casino party to a whole new level. Viva Las Vegas! Try one of our other casinos if Elvis has "left the building!"